Heat oven to 375°F. Line cookie sheet with Reynolds Parchment Paper; set aside. In large bowl, stir cookie mix, butter, orange extract and egg until soft dough forms. Stir in apricots until blended. Drop dough by rounded teaspoonfuls 2 inches apart on lined cookie sheet. Bake 8 to 10 minutes or until edges are light golden brown. Cool 3 minutes; remove from cookie sheet to wire rack. Cool completely, about 15 minutes. In small microwavable bowl, microwave chocolate chips uncovered on High 1 to 2 minutes, stirring every 30 seconds, until chips are melted. Dip each cookie halfway into melted chocolate, letting excess drip off. Place on waxed paper and let stand until chocolate is set, at least 2 hours. To quickly set chocolate, refrigerate cookies 15 minutes. Store between sheets of Reynolds Parchment Paper in tightly covered container at room temperature. Place food directly on Reynolds® Parchment Paper and bake as directed. Treats will bake evenly and release from paper with ease. Plus, because you're baking right on the paper, clean-up is a breeze. 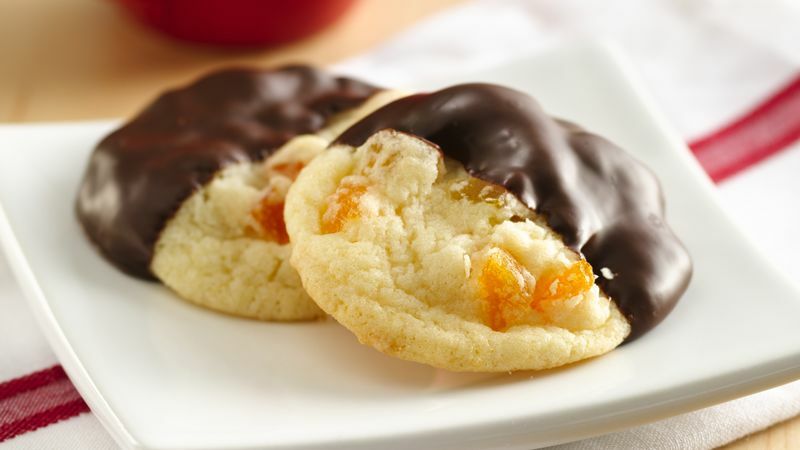 Use premium white chocolate for the dark chocolate and drizzle it over the cookies instead of dipping.